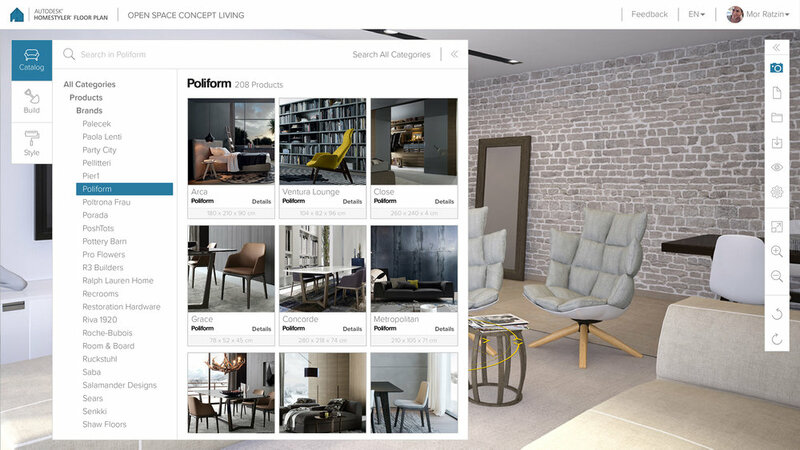 Floor Plan is a browser based home design tool for both consumers and professionals. Floor Plan is entirely unique thanks to its natural use of a live 3D environment that allows users to design spaces the way they experience them. Shortly after release, Floor Plan became a business success bringing numerous high value SaaS contracts with multinational corporations. Its main selling point is its innovative user experience. Designing spaces in 3 dimensions requires developing easy to use manipulation tools. Being able to seamlessly switch between the two live environments is crucial to the overall experience. Even though this is a complex design tool, we didn't want the UI to look and feel complicated. Therefore, we put effort into designing an interface that’s simple and intuitive, and accessible to a wide audience. The 2D environment allows exact planning while the 3D environment represents the natural design experience. Each B2B client has their own pre-rendered catalog of products that drives companies in unique professional niches to license their own version. The welcome screen serves both consumers and professionals by pre-populating starting points according to business requirements.